Pretty sure this is from a Judge Dredd story, but I can't remember which one or who wrote it. Back at the start, Birdy was our PoV character in Grey Area, not Bulliet. Shiny covers. Hard people. Real people. Gruff people. Unfussiness. If I was being harsh, I might say that he his general sense of panel layout/design makes for some thrilling and arresting covers, but can feel a little static in panel-to-panel comics. I especially love his textures – skin, hair, clothing and of course weird alien/metal synthetic fabric-y stuff. 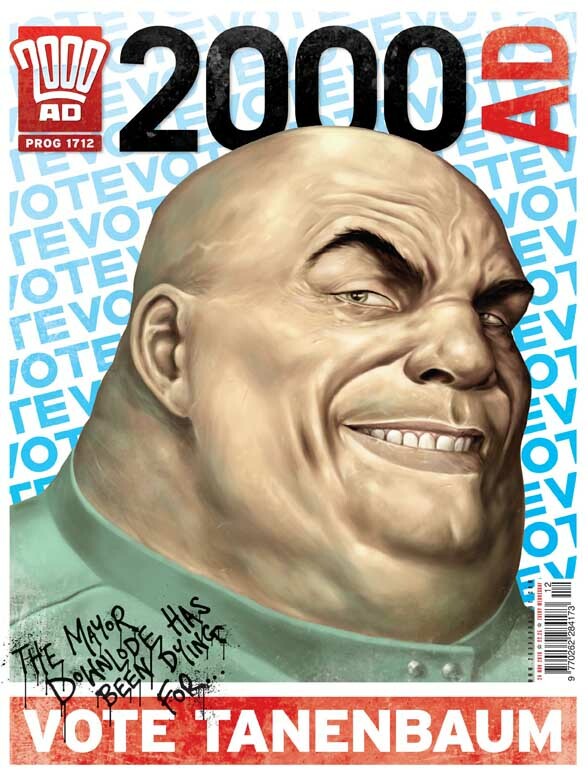 Of all the 2000AD series that deserve an animated film version, I kind of think Outlier might work the best. 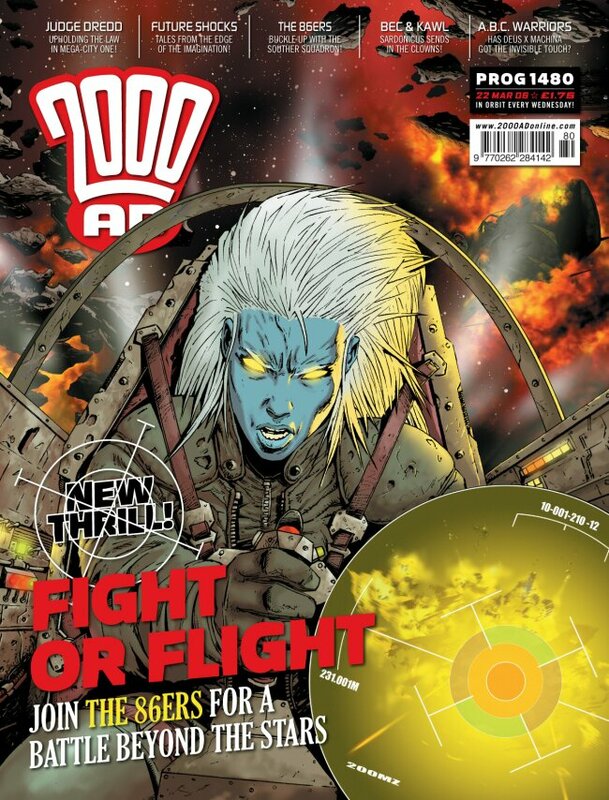 I first really took notice of Karl Richardson on the cover for Prog 1480, which sees Rafaella Blue bursting her way into a solo series, the 86ers. It achieves that dream of exciting action and fierce characterisation. I want to know what’s happening in the story, and I want to know more about her, specifically. This cover is the single best thing about the 86ers. It's a doozy! Sadly for me, the 86ers turned out to be fine, but not super exciting. And Mr Richardson only lasted as the series artist for two episodes. 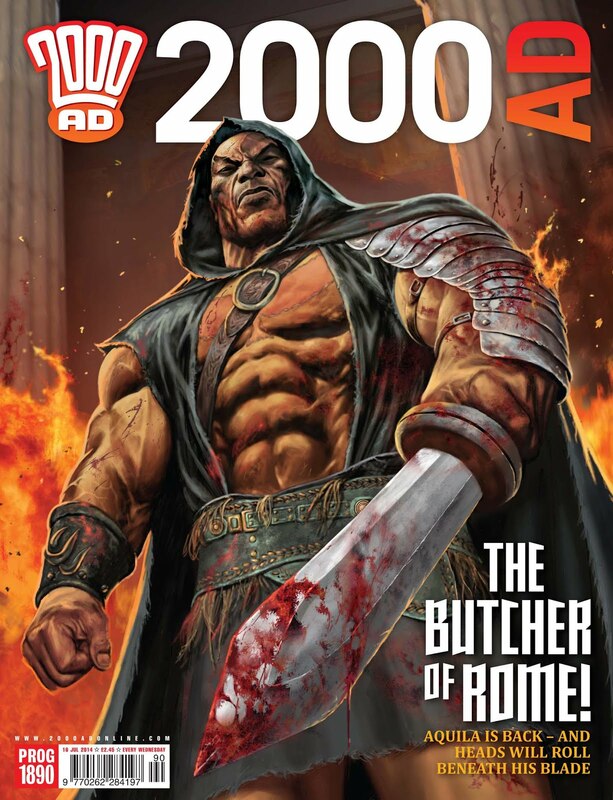 This is actually pretty common in 2000AD terms – get one artist with a strong design sensibility to flesh out a new world, then get another artist (often quicker and more of a storyteller, in this case PJ Holden) to deliver multiple episodes. Richardson did, very effectively, set up the basics of The 86ers - hardmen in space getting cross with each other, sometimes for virus-based / supernatural reasons. Richardson brings the horror. He excels at scenes of everyone just going murderously nuts. But he’s actually proven rather productive on the strip front of late, especially with 30 episodes of Outlier delivered in just over a year. And it’s good stuff! A cracking cover, sure, but not the best thing about Outlier. Indeed, like those two aforementioned artists, he’s often saved his very best work for the big man himself, Judge Dredd. 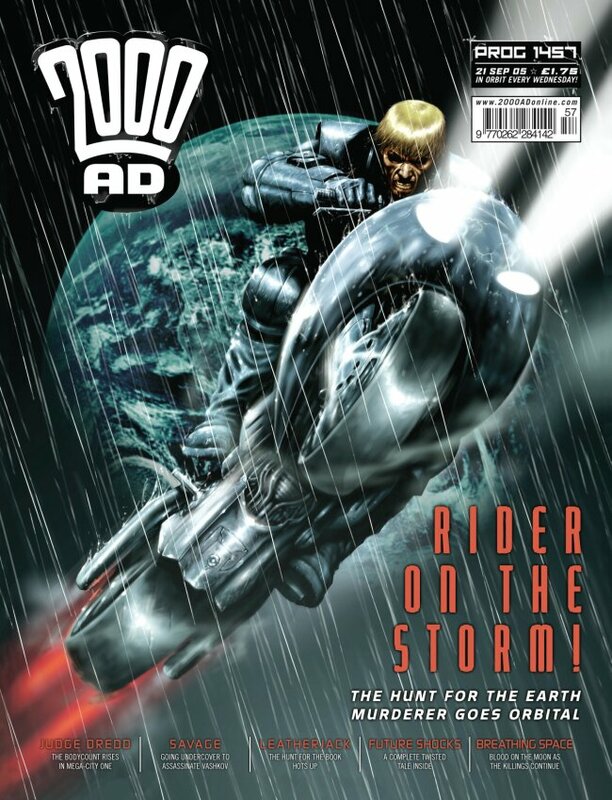 I feel like I’ve gone on about it on previous posts, or elsewhere in life, but one of my vary favourite Dredd stories from the last decade was Rehab, written by Al Ewing and drawn by Karl Richardson. Not all artists can deliver a convincing 'I am strong enough to literally crush your skull' panel. It never gets old! It delivered both Rage Hard and Dredd’s ‘nice’ counterpart, and it’s one of the few Judge Dredd tales that immediately grabbed me like the early, funny ones did back when I first read the Prog during the Wagner/Grant partnership. Rage Hard cannot do anything but rage. And deliver extreme violence. I don’t know if it’s deliberate, but I find his version of Dredd's scowl and chin puts me in mind of John Hicklenton. And that’s a compliment. Richardson has an affinity for characters like Dredd – big, hard, gruff men with uniforms and high-tech equipment. 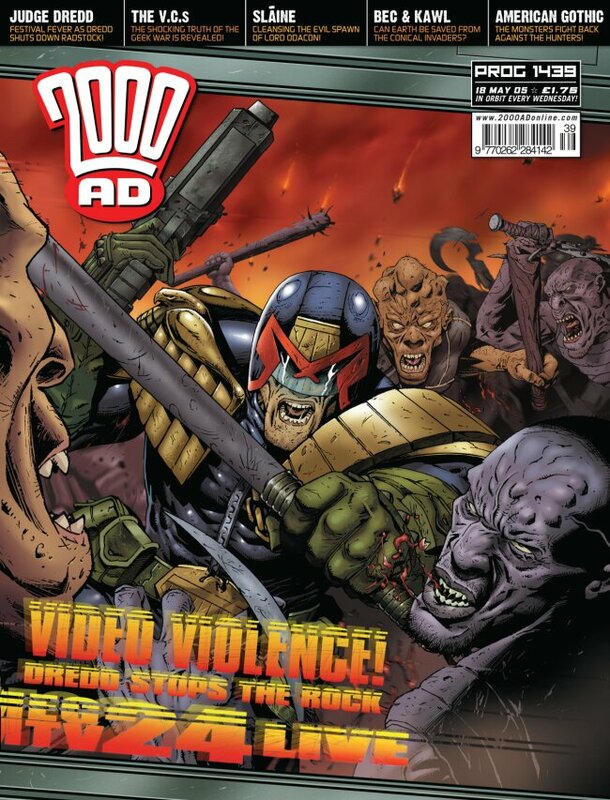 That visor, that scowl, those sunken cheeks - it's Dredd as horror icon in the HIcklenton vein. Back to Grey Area. It’s the right fit for Richardson, I think. His sense of realism, and love of hardmen, is ideal for the setting of near-future law enforcement types, who have to scowl while wearing body armour and carrying big guns. He also established the atmosphere of the strip. The Grey Area, and the ETC team who staff it, are somewhat underfunded and unloved by the government that presumably pays for it. Everything is a bit drab and run down; people work hard but don;t necessarily take pride in everything they do. 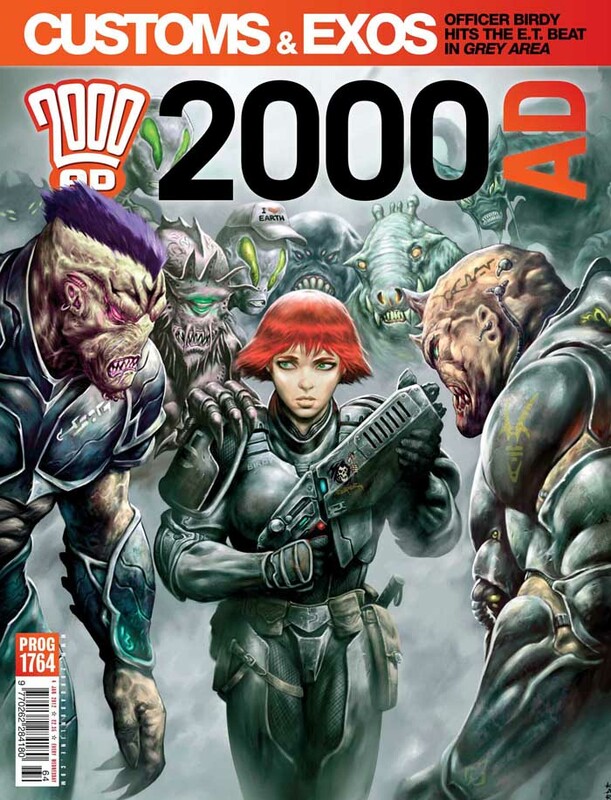 It's classic blue-collar 2000AD. Grey Area is also a classic piece of Dan Abnett 'people carry on simple conversations while bad craziness goes on around them'. Quiet moments punctuated by exploding heads - Richardson delivers simple but effective comedy. Lately of course Richardson’s big project has been Outlier. It’s another of those strips that benefits a lot from being read in one sitting – the plot was rather dense and that can get lost on a week-by-week basis. Richardson had to sell the strip pretty hard with three key character designs: Carcer, the no-nonsense detective called in to investigate a string of murders; Caul, the timid ship’s technician who was kidnapped by the Hurde, and finally the hybrid Caul/Hurde creation that is the killer Carcer is hunting (revealed in the first episode, lest you think I’m spoiling anything!). That's Caul in human form on the left, and Hurde hybrid form on the right. And in full Hurde form crashing a party. The sheer number of incidental extras Richardson had to conjure up and dispatch was positively exhausting. In fact, writer TC Eglington puts Richardson through his paces by demanding a new character each episode for series one, mainly put there to be murdered by Caul. It’s 50/50 for me whether the character designs come off. When they work, it can be both delightful and hilarious. When they don’t, it can be a little hard to remember who’s who. One thing that’s never less than clear is what each character is emoting. Outlier is all about people trying but failing to hide their motives and emotions, often defaulting to sarcasm. People emoting. It's not subtle, but it's makes it easier to see what's going on! 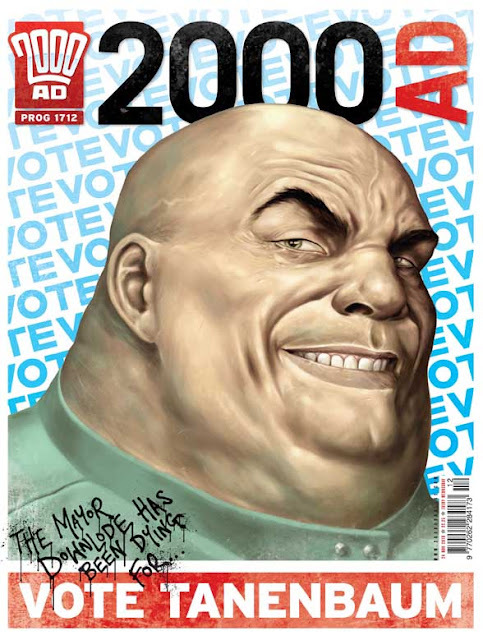 But of course, 2000AD is a sci-fi action comic, and readers come for the glorious visuals depicting high octane and outlandish sci-fi ideas. And that’s where the Hurde come in, with their organic live-action 3-D printing technology. Or the humans answer to this, the armourigami droids. Richardson makes this plausible, without stopping to forget that what the readers also want is bloody, painful violence. That's Carcer at the top, who has something of the Hurde about him, and a swarm of nanobots-type things. It's about to go down! Also, dig that cool blue-shimmer effect. 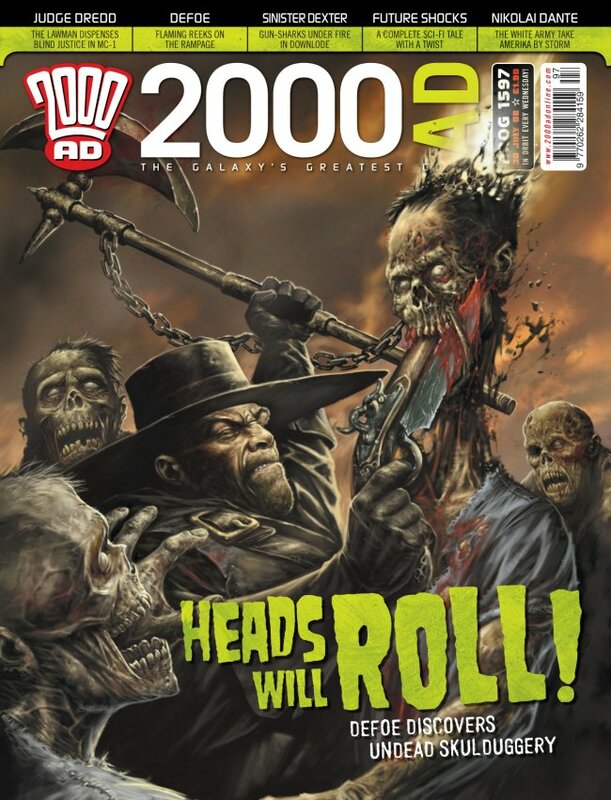 Now that's a 2000AD double-page spread right there! This is what brings in new young readers, I'm telling you. There’s a lot of plot in Outlier. But over three series, Richardson finds space to let the tone breathe when it needs to. There’s a stunning shot of a solar system exploding half-way through. And of course the ending is one of the more memorable and bleak bits of 2000AD history. Sure, skulls and flowers are a cliché, but they’re so lovingly rendered that it feels earned here. Bye bye, human race! Skulls and flowers may be cliche, but in this case, it was well-earned. The colours and tones in these panels are also pointedly different from what came before, really putting across how much this ending has changed the world. Subtle but delightfully effective. 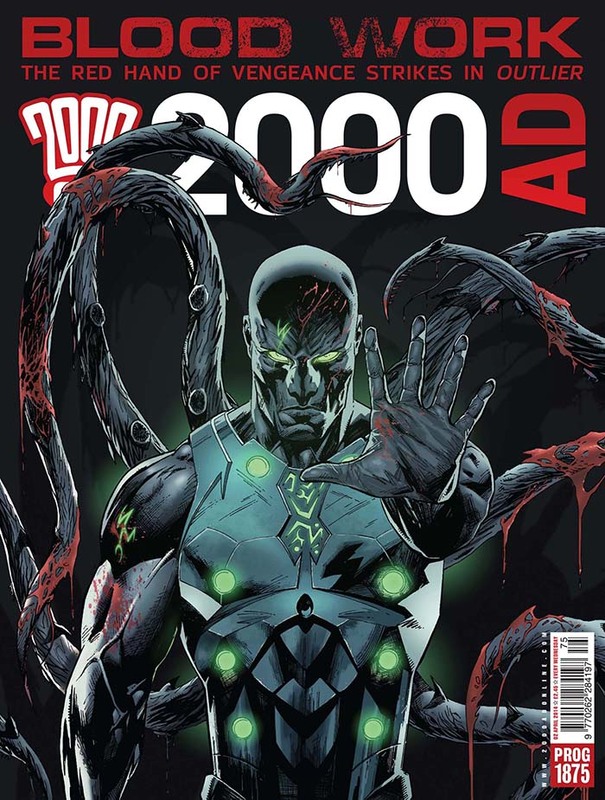 With the right stories to play to his strengths (most especially in the world of Judge Dredd), Karl Richardson is one of Tharg’s more proficient droids of the day. Just lately, Richardson has been back in the Prog with a vengeance, dashing off one of the greatest giant robot/demon creations I've ever seen. Behold Mechastopheles, and despair! I'd never compare Richarson's style to Kevin O'Neill, but by golly does this bring the same goosebumps that came with the Torque-Armada from Nemesis Book III. Bring back Mechastopheles! 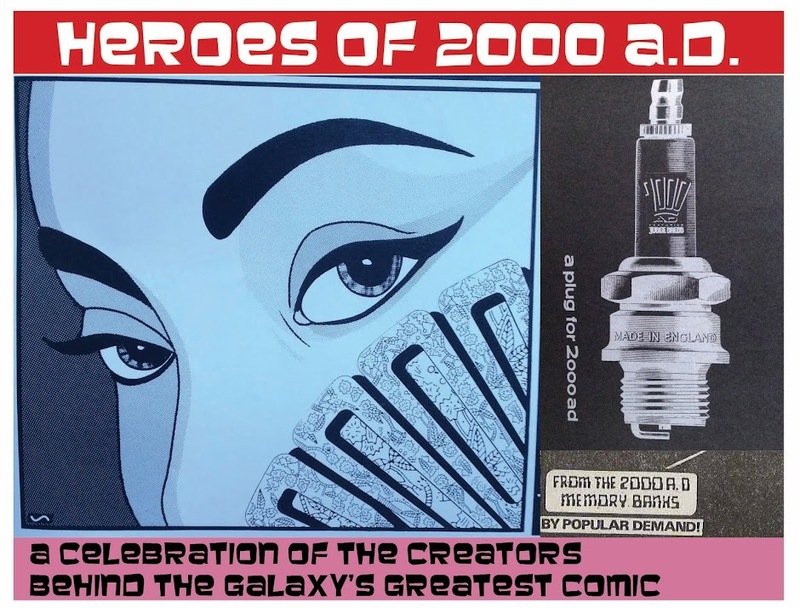 *In that he drew the first few episodes of the first series. Arguably, the world of Nu Earth was already well established by this point, and lead character Rafe, along with her ship, had already been introduced by Simon Coleby.